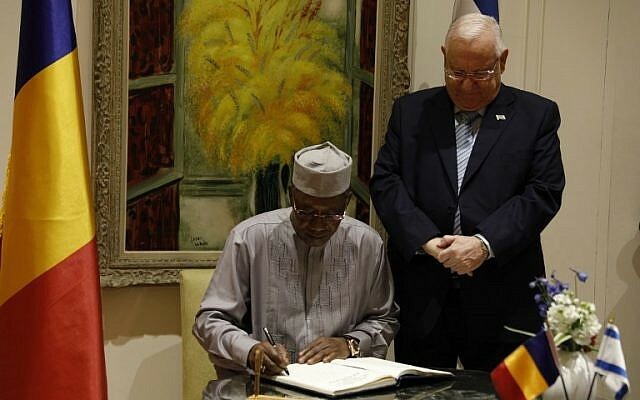 N’DJAMENA, Chad — Prime Minister Benjamin Netanyahu and Chadian President Idriss Déby on Sunday announced the reestablishment of diplomatic relations, bringing the number of countries that Israel has formal ties with to a record of 161. 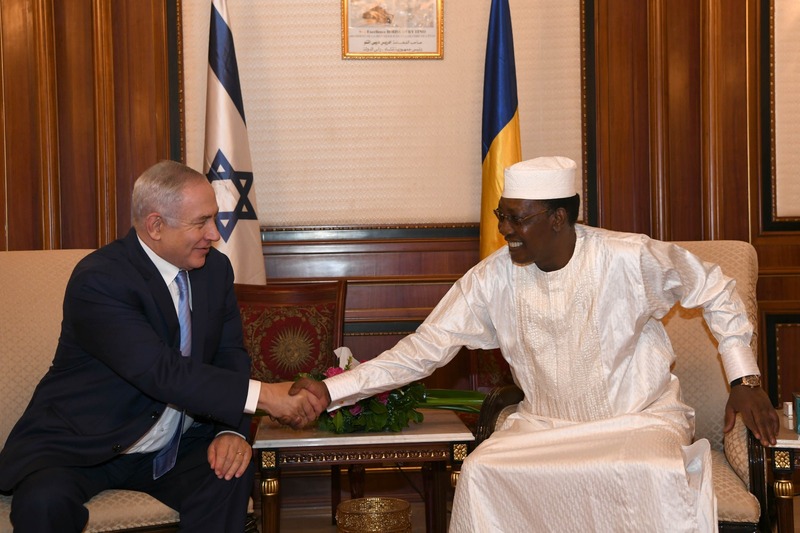 “Chad is a very important country, and very important for Israel,” Netanyahu said during a joint appearance with Déby at the N’Djamena presidential palace. “There is a lot that we can do together. We discussed ways to deepen our cooperation in every field, beginning with security, but also agriculture, food, water, energy, health and many more,” he added, speaking in English. Chad severed ties with Israel in 1972 due to pressure from Libyan strongman Muammar Gaddafi. Déby, who spoke before Netanyahu, said his country and Israel had agreed not only to renew diplomatic ties but also to increase bilateral cooperation in a wide range of fields. “Chad will do everything it can to strengthen the ties between the two countries and the bilateral cooperation in various matters,” he said. Déby also reiterated that Chad’s renewed commitment to relations with Israel does not negate his support for the Palestinian cause. “Our friendship to Israel does not replace our concerns on the Palestinian issue,” he said, speaking in French. “We are in favor of advancing a peace process between Israelis and Palestinians. And therefore I renew my call on the State of Israel to engage in a peace process… based on previous agreements,” he added. Before their statements, Netanyahu and Déby had a lengthy meeting, during which the details of the agreement were finalized. The last country to renew diplomatic ties with Israel was Nicaragua, in March of 2017. The Central American country had severed diplomatic relations seven years earlier, in protest over an incident during which violent pro-Palestinian activists and IDF troops clashed aboard the Gaza-bound Mavi Marmara ship. At the time, Netanyahu did not fly to Nicaragua for a ceremony. Before taking off for N’Djamena, the prime minister alleged that Iran and the Palestinians were trying to prevent Israel’s diplomatic push. “This is very disturbing and even causes outrage in Iran and among the Palestinians who are trying to prevent this. They will not succeed,” he told reporters. Netanyahu also indicated that additional Muslim countries in Africa would soon warm up to Israel. “There will be more major news. There will be more countries,” he said, without elaborating. 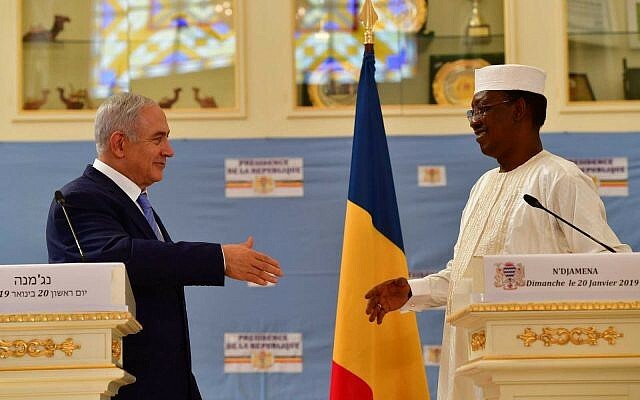 After arriving in the blistering heat of N’Djamena, Netanyahu was greeted at the tarmac by Chad’s Foreign Minister Mahamat Zene, the country’s second-highest official, and a very modest welcoming ceremony. As opposed to other foreign states that have hosted Netanyahu, there was no honor guard or marching band. The national anthems were not played. 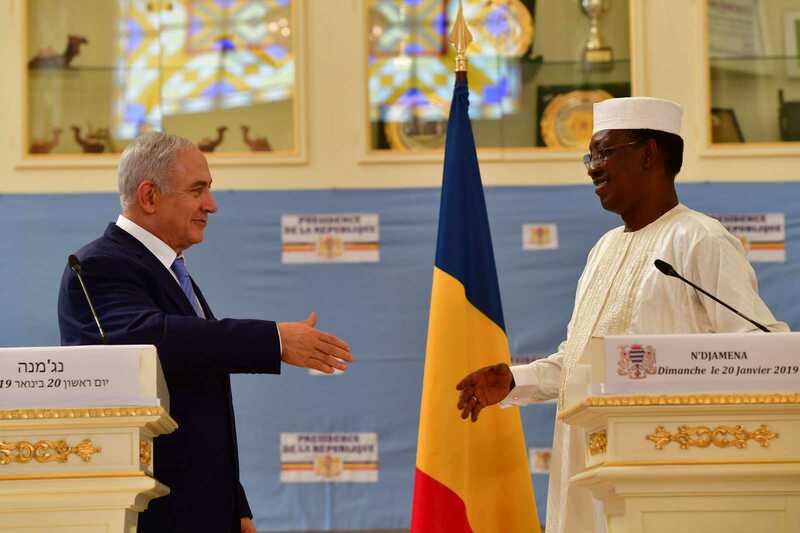 In N’Djamena, which is located on the border with Cameroon, Netanyahu was also widely expected to boost defense deals and other trade ties with Chad. For that purpose, he was joined by senior officials from the defense and finance ministries, Israel’s Kan broadcaster reported on Saturday. Chad is located in a potentially strategically important place for Israel, as it could enable Israeli aircraft to shave off several hours in flight routes to Latin America (though for this to happen Israel would also need to get overfly rights from Sudan, which does not appear imminent). Netanyahu’s flight, which had to skirt Libya and Sudan, lasted nearly eight hours, despite N’Djamena being only 3,000 kilometers (1,800 miles) from Tel Aviv. Rather than flying directly, Netanyahu’s Boeing 747 took a huge detour, flying over Ethiopia, Kenya, Uganda, the Democratic Republic of the Congo and the Central African Republic. Some 15 million people live in Chad today, 52 percent of them Muslim. About 43% are Christian. Israel and Chadian leaders have acknowledged that clandestine contacts continued even after relations were severed. 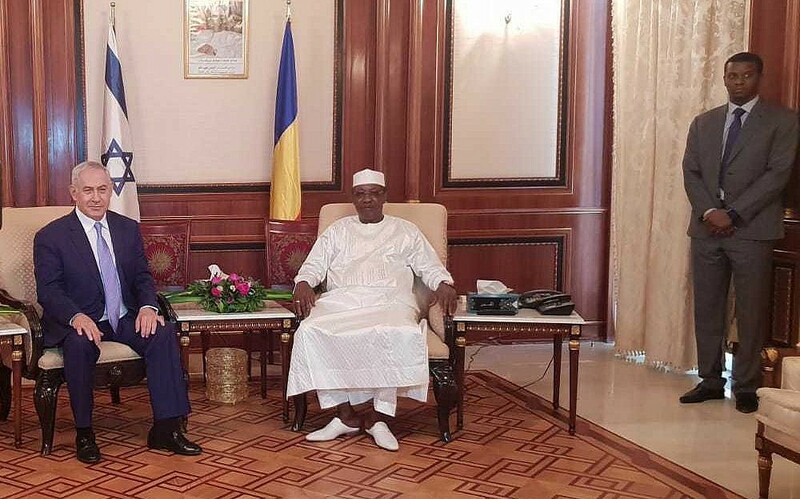 “The relations between our countries were cut in 1972 for specific historic reasons, but our special relations continued all the time,” Déby, who has ruled Chad since 1990, said in Jerusalem in November. At an event n November at the Jerusalem residence of President Reuven Rivlin, Déby said Israel is “an important partner” for Chad. “Of course, peace has not yet come to the region. Peace is what every people needs to live a good life. I want to say to you that diplomatic relations with Israel would not make the Palestinians disappear. 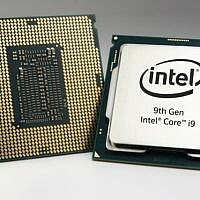 This is a critical issues that must be dealt with,” he said. Netanyahu has traveled three times to Africa in the last two years, visiting Kenya, Rwanda, Ethiopia, Uganda, and Liberia. He regularly vows to expand ties with all countries on the continent, including those that do not have diplomatic relations with Israel. 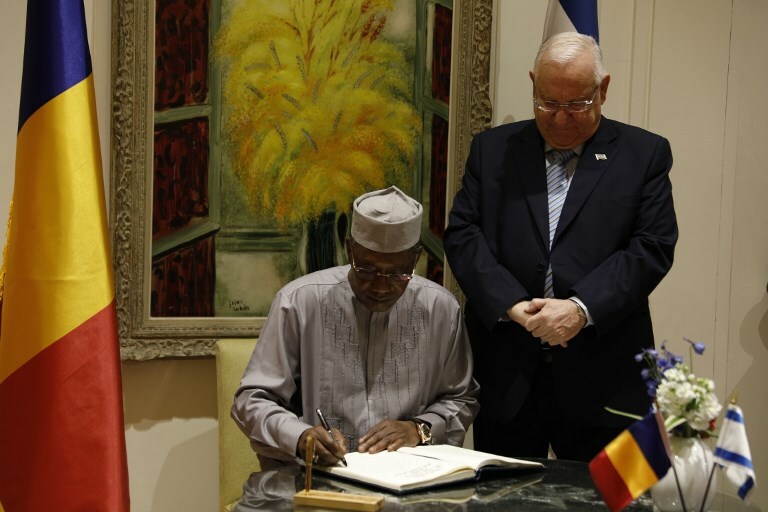 In July 2016, the Republic of Guinea, a small, overwhelmingly Muslim country in West Africa, renewed diplomatic relations with Israel, after it had cut ties with the Jewish state in 1967. Since then, Netanyahu has met with leaders of additional African Muslim-majority states, such as Mali and Somalia.